There’s a lot to celebrate at Il Colosseo in New Milford. The restaurant will mark its 25th anniversary at its current location - 38 Park Lane Road (Route 202) - in April. More recently, though, the restaurant is celebrating a change of management, renovation and new menu. The restaurant has three sections: a dining area, which has a small separate room for dining and private parties; a lounge/bar; and a takeout window. Des Biens said her longtime business partner, Ignazio Alferi, recently stepped down and her nephew, Roberto Pizzo, came aboard as manager and chef. The restaurant’s revitalized look features new siding and a new sign, as well as fresh interior paint and new décor. “It’s a little taste of Doc’s in New Milford,” Pizzo said, citing some of the dining room’s wall art, all themed on his family’s Italian heritage. Pizzo opened the popular Doc’s restaurant in 1999 on Lake Waramaug before moving the restaurant to Kent in 2008. Des Biens smiled as she pointed out some of the art that showcases her hometown of Saint Stefano Quisquina on the walls at Il Colosseo. The menu has also been revamped, and espresso and cappuccino have been added. “It’s a traditional menu with all my signature dishes, with some contemporary plates,” Pizzo said. Specials and homemade desserts are on the menu, too. Among his favorite dishes to make are mussels and Bolognese, seafood risotto and Amatrciana. “I want people to come into the dining room and have a new experience,” said Des Biens, who recently retired after 43 years of teaching at Danbury High School. Pizzo agreed, adding that his goal is to “draw people from outside of New Milford, too,” which has already happened. The chef said one of the other new touches to the restaurant is his visits to the dining room to ensure customers are satisfied with their meals. “I love to make people happy with their dining experience,” he said. Karin Smith of Danbury said she dined at the revitalized restaurant and was impressed. Smith ordered grilled calamari and seafood risotto. Smith noted the amount of fish in the dish, as well as the flavor. “Phenomenal,” she said. The satisfied customer said she is looking to go there again with friends soon. “It’s so good, I don’t know what to say,” said customer Ann Marie Chauvin of New Milford, who recently dined at the restaurant since changes took place. “It was so delicious we went back two days later,” Chauvin said. In addition to dining and takeout, the restaurant also offers catering. Des Biens’ family has a rich history in the restaurant business. The family has a restaurant in Italy, where Pizzo lived for many years and helped with before returning to the U.S. and opening Doc’s. In addition, Des Biens’ sister, Mimi Leto, operates Alfredo’s in Gaylordsville, and a brother owned the former Villa Maria on Route 7. Des Biens also owned the former Rosalia’s in Brookfield. “We have very loyal clientele,” Des Biens said of Il Colosseo customers. “I’m excited he’s with me to make the move,” she said of Pizzo. 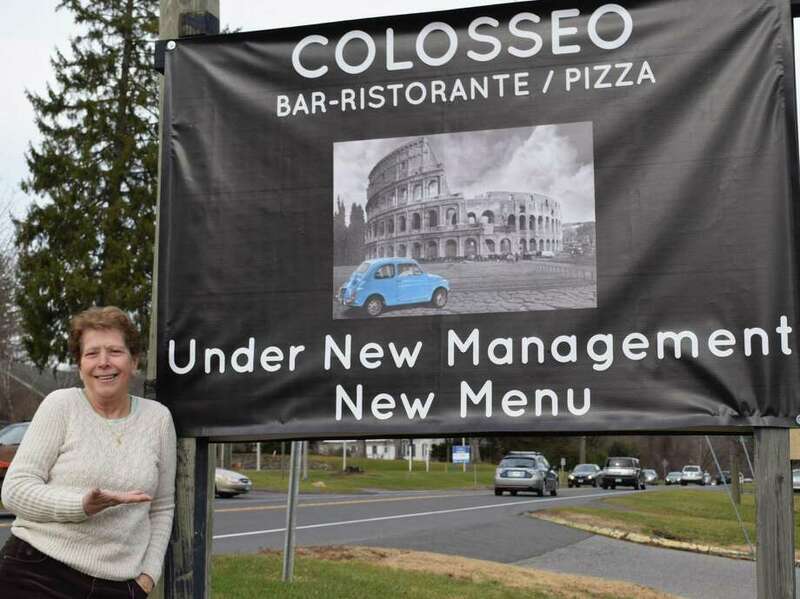 Il Colosseo, located at 38 Park Lane Road (Route 202) in New Milford, is open Mondays through Saturdays from 11 a.m. to 10 p.m. and Sundays from 11:30 a.m. to 10 p.m. The lounge/bar is open until closing. For more information, call 860-350-9596.